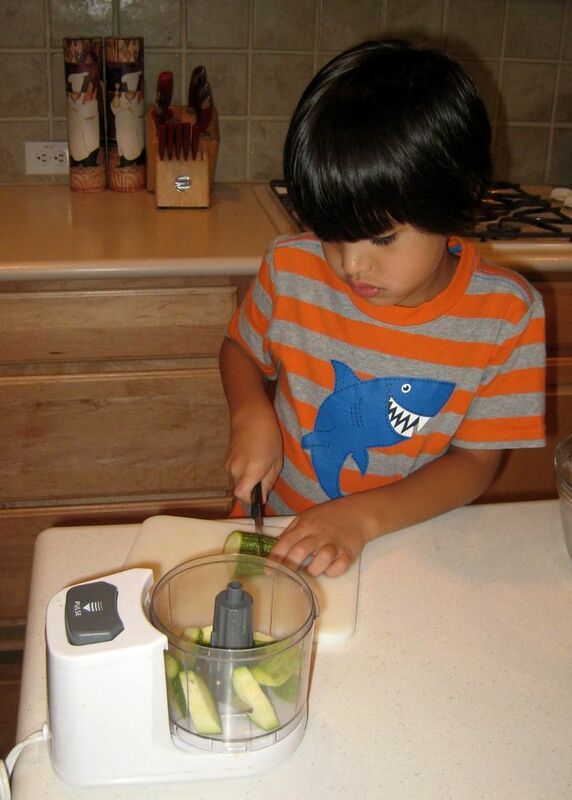 Ben is helping with The Kids Cook Monday project this week, and we're still on a zucchini kick! 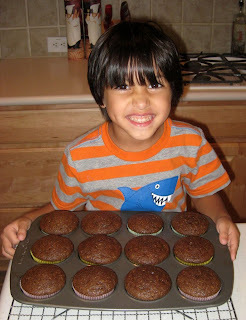 We made chocolate zucchini muffins from this recipe at AllRecipes with a few changes. I wasn't thrilled with a cup of oil, so we did half a cup oil and half a cup applesauce. I also didn't have the mixture of spices required, so I threw in a teaspoon or so of pumpkin pie spice and called it a day. 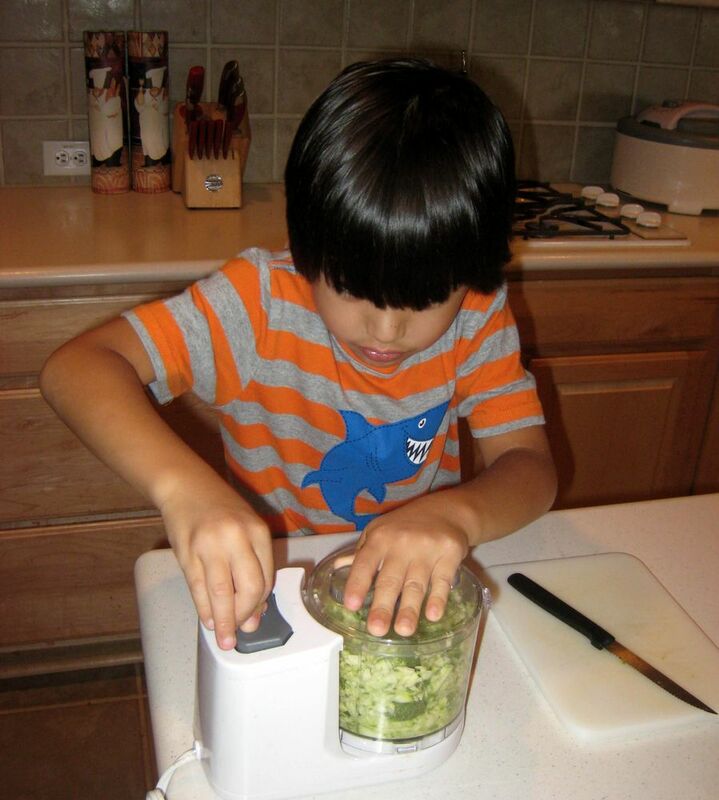 Ben got to work on slicing the zucchini so we could grate it in the mini food processor. I have a few old steak knives that are pretty dull but the serrated edges cut veggies well. They worked really well for 5 year old fingers! Both kids like the mini food-processor, it does lock so you can't run it unless everything is assembled properly and locked in place (again, good for 5 year old fingers). Ben finally figured out to crack eggs! 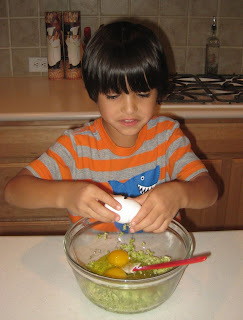 And then he immediately had to wipe his hands because eggs are slimy. And our final product, 18 chocolate zucchini muffins! Well, 12 of them, the others are on a different cooling rack. 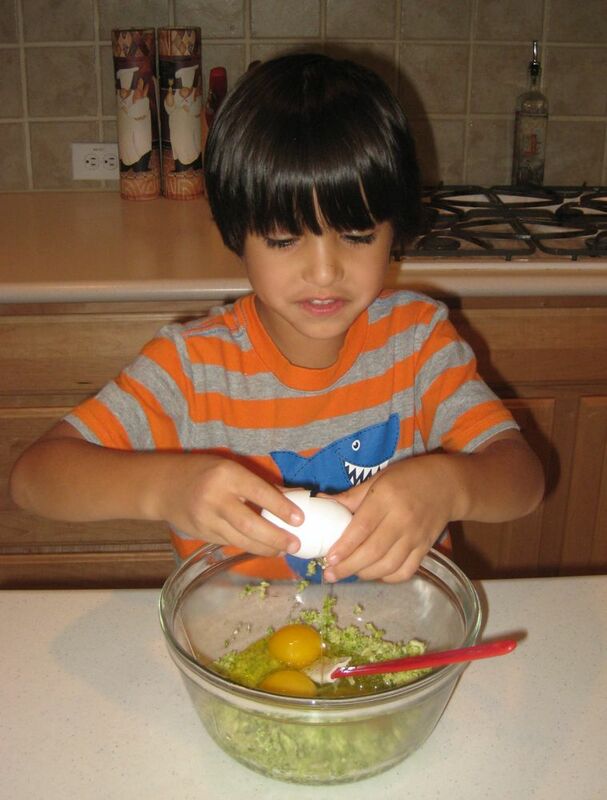 In a large bowl, beat together the eggs, sugar & oil. Add the cocoa, vanilla and zucchini and mix well. Stir in the flour, baking soda, baking powder, and pumpkin pie spice. Spoon into muffin cups, maybe 2/3 full. 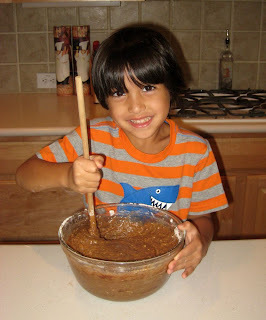 I heard substituting applesauce for oil in chocolate baked goods didn't taste very good, is this why you only did half? They look very tasty! My son has that shirt! I took out the salt, I almost always do. Deleted it from the post too, thanks! I wasn't sure on the oil/applesauce switch so decided to be safe and keep some oil. So how were they?? Would you keep the applesauce/ oil ratio the same? I just made some zucchini muffins last week that use butter instead of oil, from a recipe on Simply recipes http://simplyrecipes.com/recipes/zucchini_muffins/ (minus the nuts and cranberries- plus whole wheat flour) They were fabulous and met the approval of many young (and even picky) eaters. However, the idea of a chocolate zucchini muffins has me ready to do some more baking! Think I may just add the chocolate to the above recipe I already tried we'll see how it goes! They were a hit! I sent in 4 dozen mini muffins and she came home with 2 left over. I actually did a bit less sugar, a smidge over 1.5 cups and still split the applesauce oil (1/2 cup each). They were a little less sweet, which was good, as the first go round, they were quite rich.